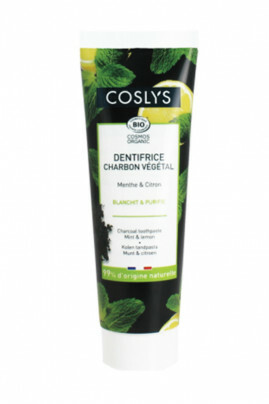 Adopt Coslys Organic Vegetable Coal Toothpaste for white and glowing teeth! Its purifying formula, enriched with French pine charcoal and aloe vera, offers a gentle and effective cleansing. It cleanses the oral cavity for perfect oral hygiene. Thanks to the essential oil of peppermint and organic lemon, it gives you fresh breath all day long. This biological toothpaste is guaranteed without fluoride, without titanium dioxide and synthetic dye. Coslys Organic Vegetable Coal Toothpaste respects teeth and gums! After each meal, brush your teeth from top to bottom for 2 to 3 minutes. Do not use in children under 7 years old. Natural ingredients for a bright smile! 11% of the total ingredients are from Organic Farming Naturally white teeth!